Did you know that the original, signed version of your will is the only presumed valid version? If your original signed will cannot be found, the probate court presumes you intended to revoke your will. If the probate court makes that decision, then your assets will be distributed as if you never had a will in the first place. However, it is possible that a copy of the will may be allowed to be probated. Even if a copy can be located, however, additional proof must be given to establish that the original will was never revoked before it may be admitted to probate. You can keep your will in a safety deposit box. 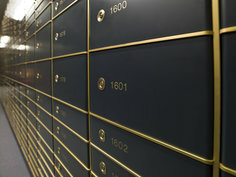 Most banks have safety deposit boxes of various sizes available to rent for a monthly fee. Banks, of course, tend to be more secure than private homes, which is one primary advantage. Also, if you keep your will in a safety deposit box, then after your death, only the Executor of your estate may access the original will. Thus, the will is strongly protected against alteration or destruction, because family members may have access to a copy but only the Executor will have access to the all-important original. But be sure to leave written authorization for the person you have named as Executor to have access to your safety deposit box upon showing your death certificate. Otherwise, it may require a court order to obtain access to your safe deposit box. Although some law firms have systems for long-term document storage of original wills, keep in mind that the law firm may dissolve before the willmaker’s death. This can make it difficult to track down your original will. At The Dean Law Firm, PLLC, on-line document storage called "Legal Vault" is available for our Preferred Client Maintenance Program members beginning January 1, 2013. Using Legal Vault, you can access all your estate planning documents via our website. Legal Vault also allows healthcare providers special access to only your medical documents, keeping your other estate planning documents private. Please call to inquire about this secure manner to store a back-up copy of your documents.